Watching Ralphie find the perfect patch of sunlight to sit & snooze in. Setting aside a few hours this afternoon to catch up on my favourite blogs. Getting photographs printed for the frames I couldn't resist in Ikea yesterday. Putting on fairy lights even though it's still light outside. Listening to Simple Things by Zero 7 because it's one of my favourite ever albums and today seems like a perfect day to play it. 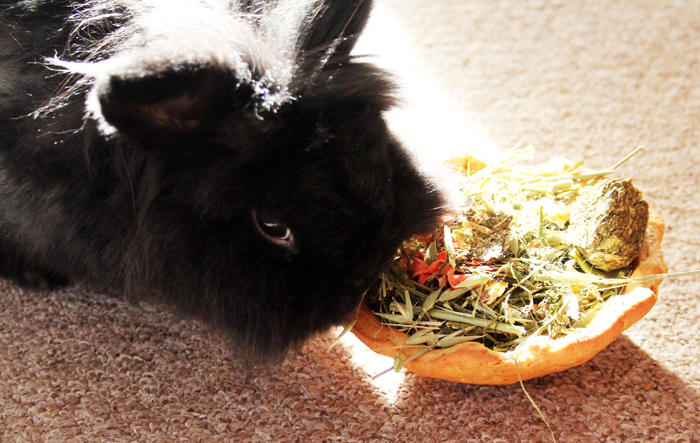 Happy Sunday from me, little Ralphie & his favourite salad bowl. We hope you're having a nice day! A lovely photo! I hope you're having a wonderful Sunday - i'm really enjoying mine today - little gym trip in the morning, also printing photos and a roast dinner later! Sounds like a wonderful Sunday! My cats and rabbit always cram together trying to get the best spot in the sun, hehe. Your Sunday sounds so perfect; just the way a Sunday should be spent! That sounds like a lovely sunday, Jennie! Today I've been pottering around the kitchen, trying (and failing) to tidy it up, and also making breakfasts and lunches for next week. Oh, there's been a bit of Twin Peaks, too. Aw, look at him! Such a gorgeous little face. That looks like a tasty treat for him, too hehe. Aww Ralphie is the cutest! Sounds like the perfect way to spend a Sunday, hope you had a lovely day! Well isn't Ralphie just the cutest thing ever! Awwwwwwwwww!!!!1! He's such a cutiepie! I used to have an albino Dwarf rabbit and he used to act like a cat/dog comng to me for snuggles and would even come when I called him by his named. Which was Bugzy by the way. Definitely makes me miss him. Ralphie is just too adorable. Love thatZero 7 album too, funnily enough I have just dug mine out of my parents' loft this weekend, along with Royksopp Melody AM. Enjoying both. This reminds me I need to print some pictures and make the house look more homely!